This look delicious! 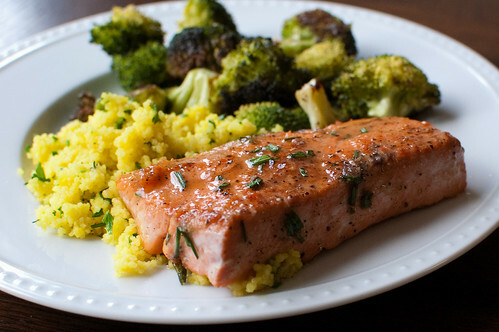 My husband and I love salmon-this looks like a wonderful new recipe I will definitely have to cook for him! My H is actually not that fond of salmon, but now I have to make it because I know he'll LOVE that glaze. I make this with orange marmalade and horseradish and it's to die for. Never thought of using apple jelly but will next time. Apple and salmon are a great combination. Yum yum yum....I recently started sharing my salmon with my 2 1/2 year old too and to my dismay (and reluctant joy) he loved it too! Now we buy whole salmon to cut the costs and have lots of leftovers! This looks like a good way to get him to eat even more "brain" food! I am always on the look out for good salmon recipes. This one looks like an absolute winner. 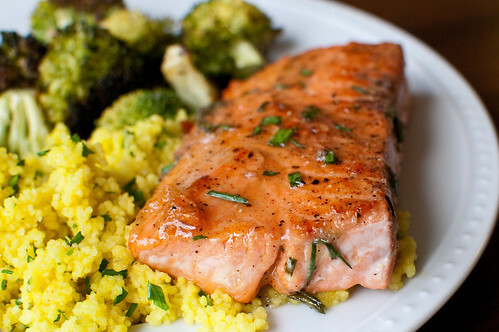 I make salmon a couple times a week so I will surely give this one a try very soon. I think that sounds wonderful - please report back if you try it! I bet the glaze would be great on pork or chicken as well! Joanne, maybe I should rename it "boy-catching salmon?" Do you think this recipe would work by grilling on a cedar plank? If so would you recommend adding the glaze during or after cooking? Also, what are good substitutes for apple jelly?